Cody Turkey Calls is proud to announce yet another a new arrival to their extensive line of award winning Drop Dead Series® turkey calls. Once again, a cutting edge box call so unique and profoundly different, the industry will never be the same! Unlike all other box calls, the Holei™ One-Sider by Cody breaks the familiar mold by incorporating new and exciting proprietary design features never before seen on ANY box call! With a complete laminated side construction, overall call strength is only the first attribute to this uniquely different call. A unique and beautifully constructed Concaved Lid™ works in conjunction with a never before seen Vertical Core™ on the striking side, creating a surface in need of very little chalk to produce easy, soft calling that applies force where and when it is needed to produce easy, soft calling of any style. The use of precisely placed holes on the call create acoustics never before heard. This is not only one of the strongest calls built in the industry, but also carries on Cody's strong tradition of calls with excellent tone quality, exceptional roll-over and unmatched ease of use. With The Holei™ One-Sider, Cody once again demonstrates an ability to take turkey calling to the next level. With unmatched design and sound quality, this call is sure to be a favorite of all enthusiasts. "The Southern Belle"TM This ol' girl is not only good lookin' ... she can cook too! I have always worked hard and long on all of our projects. In growing up, I learned that success would only come with hard work, and in those journeys some other good things will happen. The Southern Belle was created, or you could say "discovered" by building a call for a customer under our Heritage Brand - the Heritage Brand being when we take the customer's own wood from their homestead, or some other spot with special meaning to them and/or their families - and we make calls from that material. In this case we were asked to use Southern Long Leaf Heart Pine to build box calls. The material was cut almost 150 years ago. Upon receiving this wood, my comments were "this material would surely make good boat anchors, if not turkey calls". 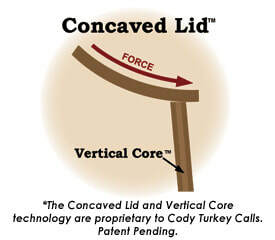 This call would never work without our invention of the Vertical Core, and engineered paddle. We informed the customer that we would do the best job possible using their materials and our technology. This was one shot and done. As we finished the the calls and proceeded to install the paddles on the boxes, we knew that this was one of those bonus gifts from hard work and power from above. One of a kind, not imitated from other products or copied from someone else. this was by far one-of-a-kind superiority in looks, tone and ease to use. After delivering the project to the customer we knew that we could not let this call be forgotten. So we trademarked it the "Southern Belle" since it was constructed from Southern Long Leaf Heart Pine. For a call to be in my vest, it has to perform... and I must say, the Southern Belle spent 2010, traveling all over the country, tucked away in a well used pocket of my vest.